Department of Economics and Management , Hunan Electrical College of Technology, Xiangtan Hunan, China. reasons of the direct foreign investments. ic development and national comprehensive strength. important role in analyzing direct foreign investments. dustrial economi c growt h.
trend, consistent cha nges rate and unstable characteristics. 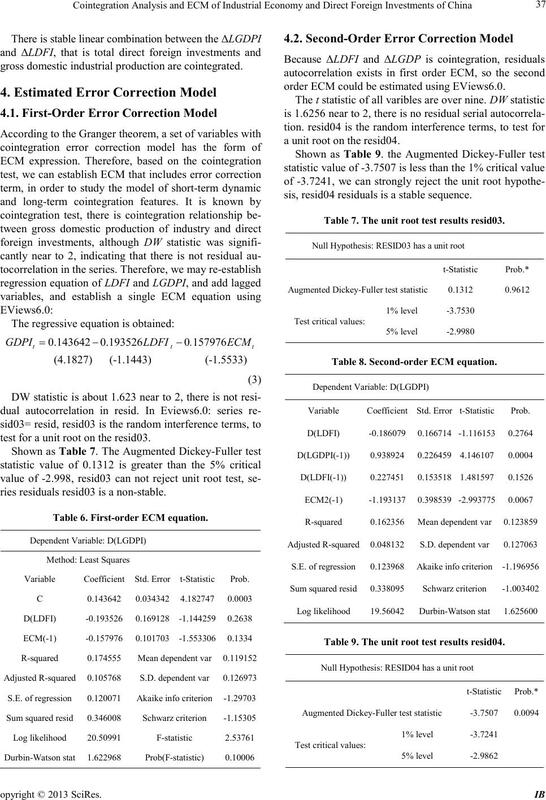 Through the ADF testing, GDPI and DFI is unstable. 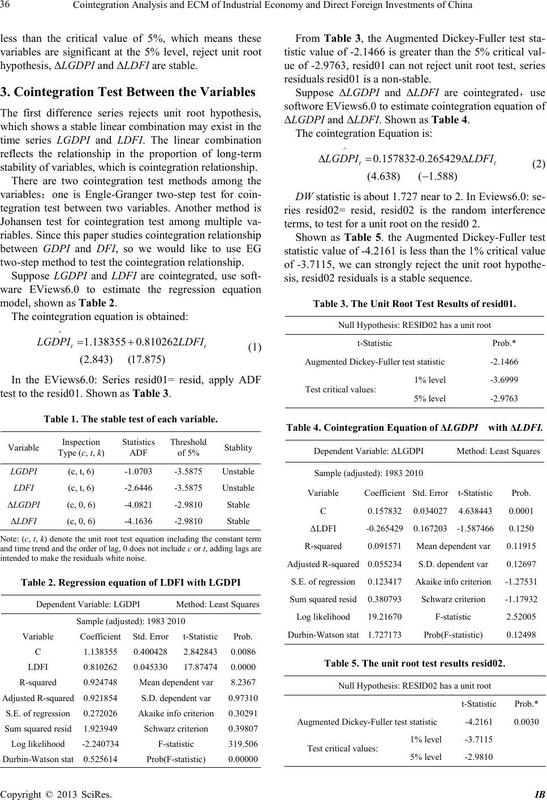 hypothesis, ΔLGDPI and ΔLDFI are stable. stability of variab le s, which is c ointegratio n re la tionship. two-step method to te st the cointe gra tion relationship. model, shown as Tab l e 2.
test to the resid01. Shown as Table 3. Table 1. The stable test of e ach var iabl e .
intended to make the residuals white noise. Variabl e Coeffi cient Std. Error t-Statistic Prob. resid uals resid01 is a non-stable. ΔLGDPI and ΔLDFI. Shown as Table 4.
terms, to test for a unit root on the resid 0 2.
sis, resid02 residuals is a stable sequence. Table 3. The Unit Root Test Results of resid01. Table 4. Cointegration Eq uation of ΔLGDPI with ΔLDFI. Table 5. The unit root test results resid02. gross do mestic industrial production are cointegrated. test for a unit root on the re si d03. ries residuals resid03 is a no n-stable . Table 6. First-or der ECM equation. order ECM could be estimated using EViews6.0. a unit root on the resid04. sis, resid04 residuals is a stable sequence. Table 7. The unit root test results resid03 . Table 8. Second-order ECM equation. Table 9. The unit root test results resid04. Table 10. Granger causali ty test variables. ation from the adjustment of the long-run equilibrium. with the rate of 119.3%. sho wn as Table 10.
is not cau s ality of the dire ct fore ign investments growth. dustrial str ucture o f Chi na. Universit y Pr ess, 2007. 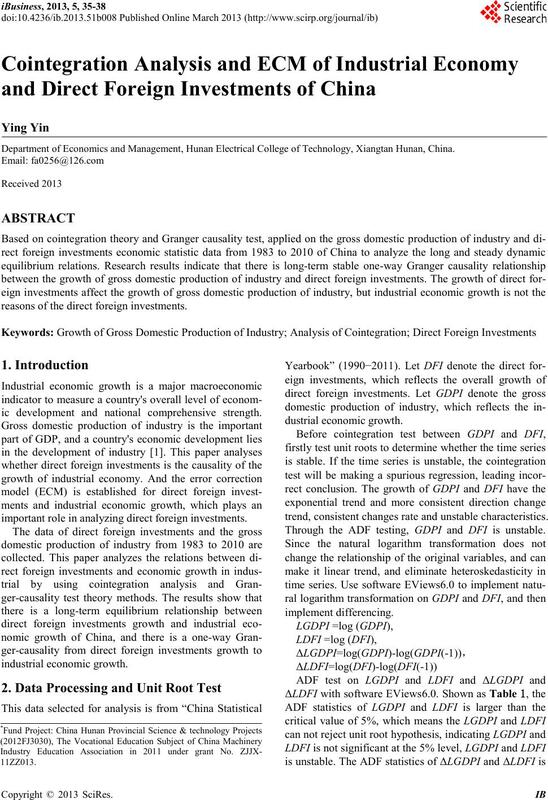 Growth of Industrial Economy and Foreign Trade [J]. 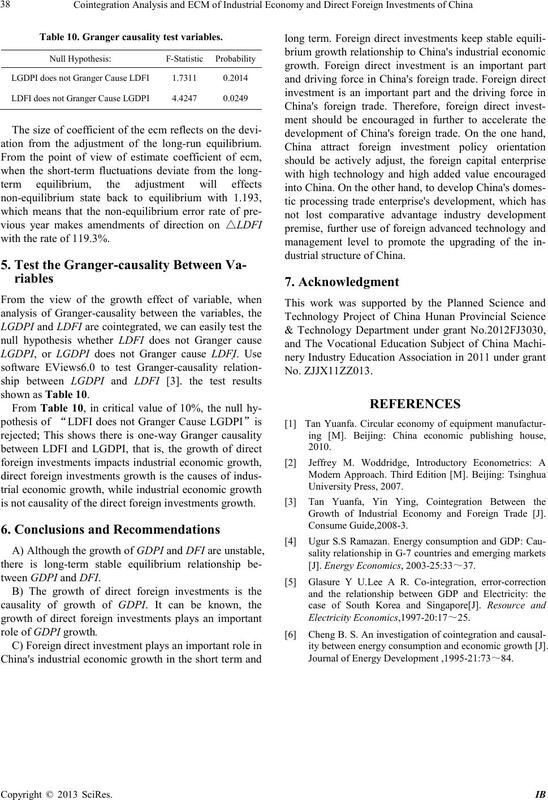 ity between energy consumption and economic growth [J]. Journal of Energy Development ,1995-21:73～84.